Sorry I’ve been so quiet lately (what do you mean, don’t apologise?) but I’ve been so very busy on lots of different projects, most of which included me using my brain to make words into stories and all of which meant me working until four am every night for the last three weeks. Well, my birthday actually meant me being awake until four am but I wasn’t technically working. And I took a break to go to NY Comic Con but I think I did manage to shift a couple of books so that counts as work, right? Right? 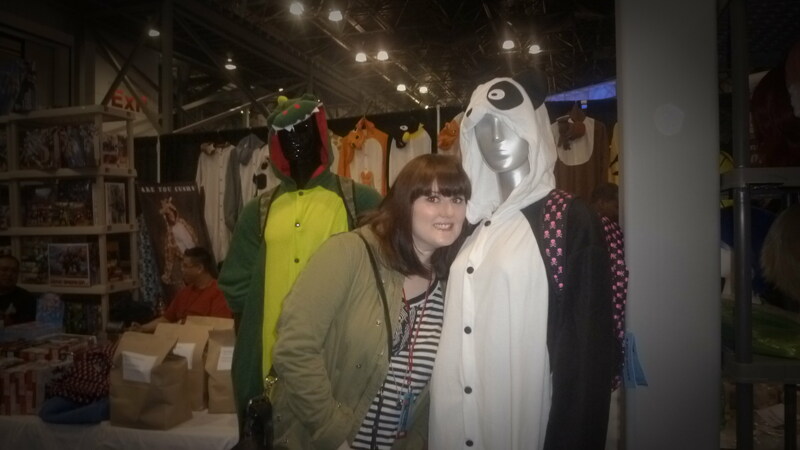 This is me trying to convince my friend to let me buy a $50 panda suit. She did not allow it. Anyway, the main thing is, at 11.56pm last night, I finished the first draft of my next book – The Single Girl’s To-Do List and I’m so, so happy with it. I know there has been some trepidation about this one not being an I Heart book (for me too!) but firstly, I thought Angela deserved a bit of a break – she’s been through a lot – and secondly, I had this story I really wanted to tell and it didn’t fit in Angela’s story so… I’m not phrasing this well. My name is Lindsey, I am mostly writing the books for a living. So I really love this story. I love the characters and I was sad to finish writing because I sort of wanted to know how things were going to play out for them. I can’t wait for you to meet them too. I also can’t wait to do all my laundry, go food shopping, make my bed, clear the three foot pile off crap off my bedroom floor and generally Go Outside. Everything sort of stops for the last month of writing. Everything except Comic Con obviously. They declined to delay it for me. 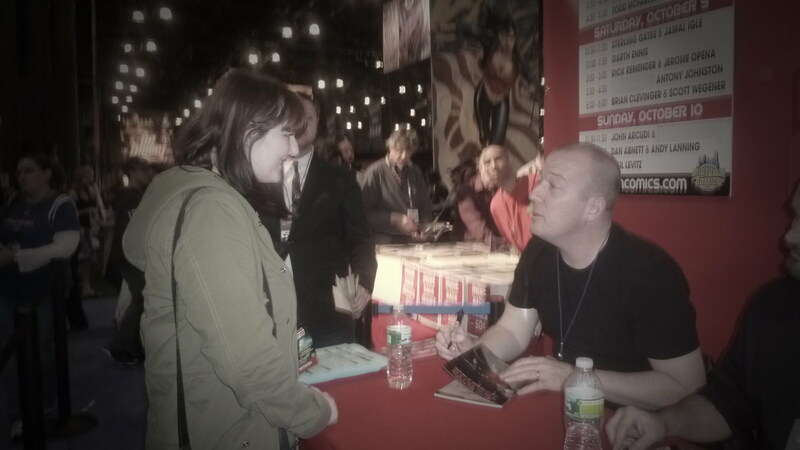 This is me talking to comic legend/god/real writer Garth Ennis. He was not familiar with my work. So, I’m now waiting on my fabulous editor’s comments and starting the rewrites, of which there will be many) but I’m so excited to tell you more about it as we get closer to it coming out. Next year. July. It’s on Amazon. Mew. Hi Lindsey. I’ve just finished reading I heart New York.. I read the Paris one a few weeks ago and found it amazing, I’m going to start reading Hollywood tonight.. I’m a huge fan and think your books are fabulous, I don’t want to put them down once I start. Looking forward to your next releases, stay gold.